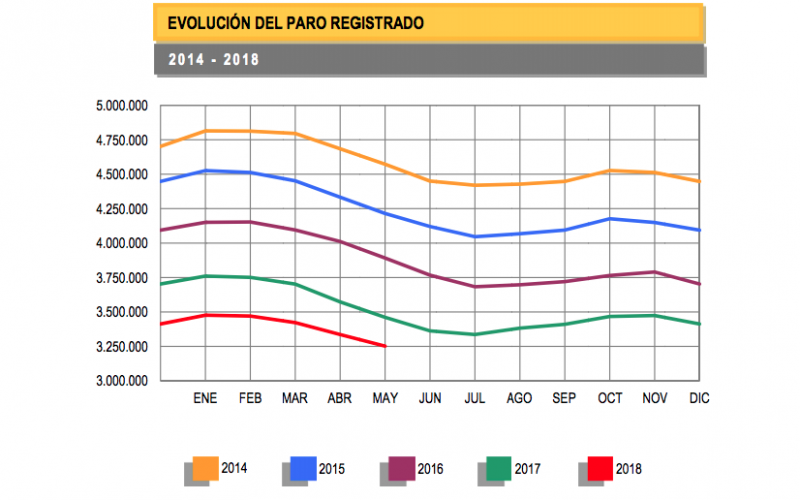 There are now 3.25 million Spaniards who are officially unemployed, new data from the Employment Ministry showed for the month of May, 83,738 fewer than in April this year, but a smaller fall than between the same months in 2017. Compared to May 2017, there are 208,998 fewer people registered as unemployed. Monday’s new figure is the last one from the government of the now former Prime Minister Mariano Rajoy (Popular Party, PP). Socialist Party (PSOE) leader Pedro Sánchez was sworn in before King Felipe on Saturday after winning a vote of no confidence against Mr. Rajoy on Friday. Mr. Sánchez has yet to appoint a new Economy Minister. Most of the regular annual reduction, 53,542, came in the services sector as Spain gears up for another summer of tourism. 1.77 million Spaniards are claiming unemployment benefits. The latest data from the other major indicator of unemployment in Spain, the National Statistics Institute’s (INE) quarterly Active Population Survey, showed 3.8 million unemployed people across the country. The Active Population Survey is a broader survey of a person’s self-reported economic status, versus the more formal registered unemployment numbers at the Employment Ministry. Both totals are now far from the worst moment of Spain’s economic crisis, in the first quarter of 2013, when Mr. Rajoy had been in office for just over a year. The first quarter Active Population Survey from the National Statistics Institute in 2013 was 6.28 million unemployed people.